According to a recent report by Turkish news outlet Fanatik, Wolves are hoping to secure the services of Kasimpasa centre-forward Mbaye Diagne during the January transfer window. It is believed that the West Midlands club are looking to bring in some fresh faces in their attacking department and Diagne fits the bill perfectly. Nuno Espirito Santo’s side has made a solid start to their Premier League campaign. However, they have struggled to score enough goals going forward. Wolves have registered just 11 goals in as many league matches so far which would disappoint their manager who prides himself for playing an open and expansive brand of football. Raul Jimenez is currently the club’s leading goal-scorer with 3 goals in 11 league starts so the Mexican international, who is on loan from Benfica, needs some help up top if Wolves are to start finding the back of the net on a consistent basis. Diagne has been a prolific goal-scorer for Kasimpasa this season after he registered 11 goals and provided two assists in 11 appearances in the Turkish Super Lig. Going by his recent form, the Senegalese forward could be the perfect answer to some of Nuno Santo’s attacking woes this term. What Will He Bring To The Molineaux Stadium? The 27-year-old striker is exceptionally versatile and can operate on either flank or as a target man up top which makes him a perfect fit for Nuno Santo’s style of play at the Molineaux Stadium. The Senegalese goal-getter boasts incredible strength and can be a commanding presence at both ends of the pitch. He is instrumental while holding the ball up and getting others into play. Diagne also has a good leap which helps him finish off chances with ease using his head. Can The Senegalese Forward Prove His Worth In England? At 6ft 3inch, the Kasimpasa talent is a significant aerial threat, and his finishing is also one of his best traits. He is the type of talent who can surely come in and do a job for Wolves in the final third. Nuno Santo should do everything in his power to lure him to English football as Diagne has all the makings of a prolific centre-forward in the Premier League. Leeds United Linked With 26 Y/O Turkish Super Lig Forward: A Complete Scout Report! Leeds United Linked With 12 Goal European Striker: The Best One Available At Bielsa’s Discretion? Reports Suggest Forward Linked With Leeds United Keen On England Move: Should Bielsa Go For It? Leeds United Talks For 26 Y/O Striker Hits Snag: Would He Be A Good Signing For Bielsa? 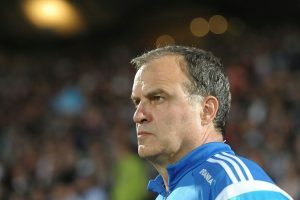 Leeds United’s ’23 Goals In 28 Games’ Target Delivers Update About Future: What Now For Bielsa? Leeds United Continue To Scout This ’20 Goals In 25 Games’ Striker: Should Bielsa Go For It?